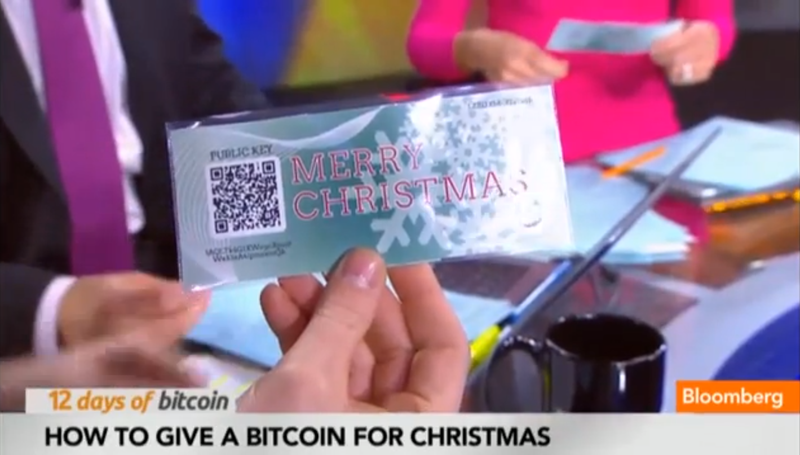 This past Friday, Bloomberg TV anchor Matt Miller took an on-air opportunity to give the gift of Bitcoin to two of his fellow anchors during his "12 Days of Bitcoin" segment. And in a beautiful twist of karmic justice, punishment for running such an absurd segment in the first place, every last digitally invested cent was stolen immediately. The guy that is hosting the series gave bitcoin gift certificates to the other two hosts. One of them opens up the certificate to reveal QR code of the private key. They then proceeded to show a closeup of the QR code in glorious HD for about 10 seconds. Hilarious. I took it, it was only $20 worth. It was exhilarating nevertheless. I'll send it back once Matt gives me a new address since someone else can sweep the old one. A segment on Bitcoin security and the importance of NOT showing the private key and also BIP0038 (Password Encrypted Private Keys) Wallets will be more than enough compensation. Blockchain confirmation and Public key of where i sent the bitcoin.